These templates have been provided for the easy creation of professional looking labels. You can add text or import graphics with no other changes or reformatting required. There is no simpler way to create the labels you need. Over-sized Folder Labels (Item No. 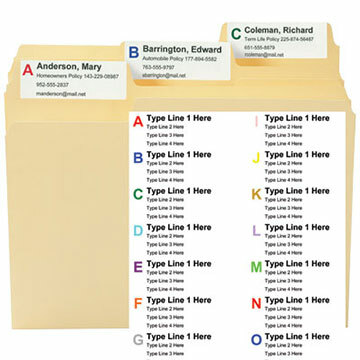 64915 Smead Viewables® Label Refill for File Folders) are designed to work specifically with SuperTab® folders, pockets and expanding files. These specialized folders are designed with tabs that have 90% more visible room on the tab than standard size folders for improved labeling. The SuperTab® products and Viewables labels may be purchased from your office supplier. Select the desired Downloadable File. The template should open in a new browser window. Click "File" and then click "Save As..." to download (save) the file on your PC. Open Microsoft® Word. Open the file you just saved to your computer. These templates have been set up using multiple tables so that the labels will print properly on the label stock. If the table border is not visible, you can use the "Show/Hide Gridlines" command located on the "Table" menu. Place you cursor in the individual label cell and type. To insert graphics, use the insert button on the top bar of the browser. Design your label in the first table cell being careful to stay within the borders of the cell. After your design is complete, Go to the bottom of the page, left click mouse and hold it down, highlight the whole page and then paste. Depending on your printer's paper feed direction place the stock in your printer and print the desired number of labels.